Automatically identify attacks and known bad actors with built-in cybersecurity intelligence feeds. Set alarms so events associated with indications of compromise are identified. Get event-time correlation to gain the context needed to investigate potential security breaches. Use custom, in-depth searches to get a better understanding of security threats in your environment. With intense increase in volume of DDoS, botnet, and malware attacks happening every day, you need a cyberthreat intelligence framework for collecting, consolidating, and analyzing all your log data and threat intelligence feeds in one place. 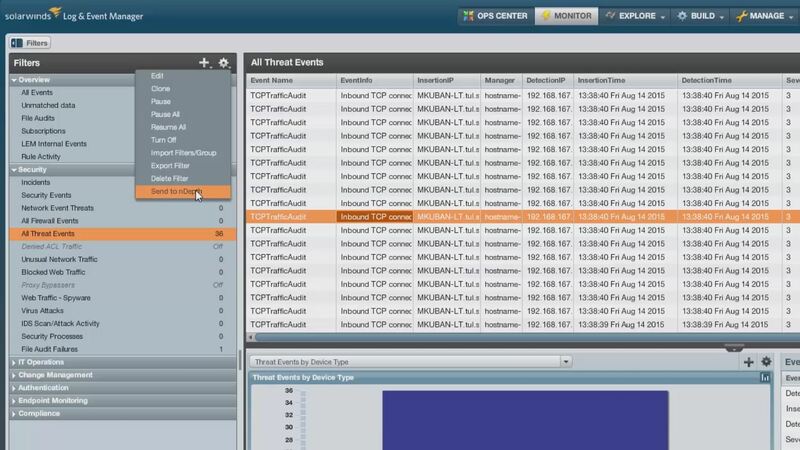 SolarWinds Log & Event Manager (LEM), an on-premises, advanced SIEM tool, comes with an active threat intelligence management system in the form of threat feeds built to automatically detect and respond to user, application, and network threats. Log & Event Manager collects and monitors logs in a centralized location. The continuously updated threat feed proactively provides cyberintelligence analysis of activities against a list of known malicious threats, and immediately alerts you when user-configured thresholds have been triggered—and known bad actors have entered your environment. Log & Event Manager comes with pre-defined rules that can add context to disparate events like unusual privileged user activity that happens out of normal working hours. You can select from pre-defined rules or manually define specific rules, such as setting operational thresholds to correlate events and automate multiple actions and notifications. You can identify trends in the information flow with visualization and discovery techniques, like parameterized search, tree maps, charts, and word clouds. This helps in filtering out inherent noise present in log data and identifying important security events. You can save these searches for later use and even export them as reports in PDF or CSV files. There is also an extensive library of reports, which can be used out-of-the box for compliance and forensic analysis. Manually keeping up-to-date with the vast amount of cyberthreats and indicators of compromise can be a huge challenge. If a threat intelligence management system is not optimized, you potentially won’t be able to take preventive measures against known threats. Lack of information on what has been changed in your environment could potentially lead to sensitive information leaks. What is a cyberthreat intelligence framework? An effective cyberthreat intelligence framework is comprised of several security methods to help improve threat management detection and response, such as continuously updated threat intelligence feeds providing the constant receipt of organized, analyzed, and refined information on potential or current attacks threatening IT infrastructures around the world.